This entry was posted in Fitness and tagged running, skiing, workout. Bookmark the permalink. 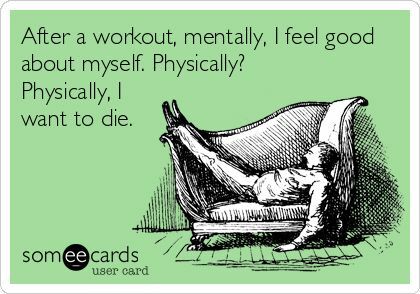 Your e-card once again summarizes my feelings about working out perfectly. I don’t get people who look human enough after working out to take a selfie. I look a few shades away from death. Right? How do people do it? I love the way you have your blog set up with your goals and how you did each week.. Super accountable!! That was my hope! There have been some weeks that I still haven’t kept up, but for the most part having this here has helped me think about it more.